Designed for comfort, the interior of the 7W was large and spacious featuring 18 in (46 cm) of slide-back seat room for front-seat passengers, arm rests, ash trays, dome lighting, deep cushions, cabin heaters, ventilators, extensive soundproofing, large windows, and interior access to the 100 lb (45 kg) capacity luggage compartment. Built during the Great Depression, the 7W was the brainchild of company-founder William G. Skelly of Skelly Oil who desired a fast, comfortable aircraft to support his tastes and those of his rich oil-executive colleagues. Unlike many pre-World War II aircraft, the Spartan 7W Executive was popular enough to see design replications continue well into the post-World War II period of aviation. Of a total of 34 7W Executive's built, many are still extant. This version was impressed into the USAAC at the start of the war as the UC-61. The Executive's high performance allowed the aircraft to compete in the 1939 Bendix Air Races piloted by Arlene Davis. It earned fifth place. A military variant of the 7W Executive was produced by Spartan with a more powerful 600 hp (447 kW) Pratt & Whitney Wasp engine and named the Spartan 8W Zeus. Packaged in a somewhat small square box, the kit itself arrives in the usual segmented plastic bag that is popular with many short run resin companies. I was pleased to see that there were few parts in each segment and that they were all related to each other (engine bits in one, interior bits in another and so on). The moldings on the parts are very good and inspection turned up no molding glitches. These are somewhat old school in that you'll need a razor saw to remove the small pour stubs from some of the parts. My kit was molded in a rather bilious green resin that reminded me of VW's of the 60s. The kit is quite well detailed as such with some detail bits in the interior. 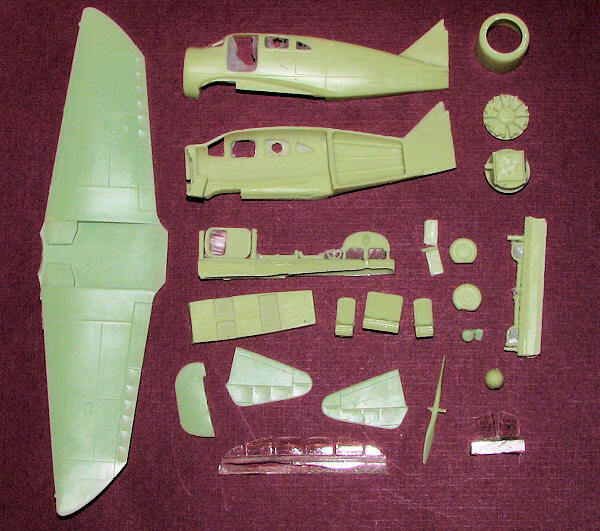 Clear parts are resin as well as while not as clear as injected plastic can be, they are still not badly done at all. The one-piece engine cowling had a few nicks in the front where the pour stub had been cut away which will need filled. There is a full engine accessory section that fits onto the fire wall and then has the engine attached to it. A well molded one piece wing is included along with separate stabilizers and a separate rudder. Landing gear is nicely done and molded on its side along with the rudder pedals and the steering column and wheel. Interior seats are also well done. There are seat belts molded onto the seats, but they could be improved by using tape or etched brass bits to make them stand out more. Markings are provided for two planes. One is the UC-61 version in OD/Neutral Grey that retains the red forward cowling and spinner of its civil markings. The second is a Texaco plane in bare metal with red forward cowling and spinner. The builder will need to match the red paint of the speed stripe on this one. No interior color information is given, despite the civil variant being based on a restored plane that is still flown. A search on the Internet will probably locate the appropriate colors in this regard. 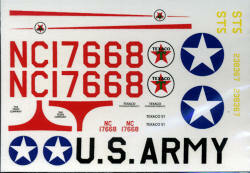 Decals are nicely printed and are probably very thin as well so one needs to take some care in applying them. I recommend Alclad II paints for the civil version as they provide the proper shine needed for this beauty. 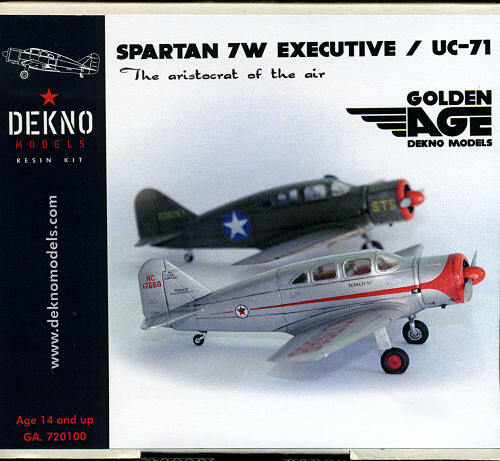 Apparently Dekno is starting a series of similar types of planes with the Executive as the first shot. I'm pleased to see this being done as civil aircraft are rarely kitted and there are some beauties out there. Perhaps they will be convinced to do a Navion. Thanks to www.coopersmodels.com for the preview kit. Get this and other neat kits from the link.